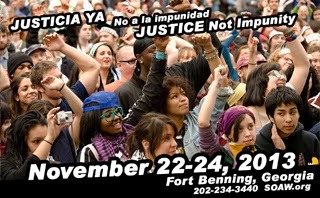 Spanish For Social Change: volunteer terps needed to shut down the US army's School of the Americas! volunteer terps needed to shut down the US army's School of the Americas! I am yet again helping to organize the interpreting at the vigil to close the School of the Americas - a US army training camp for Latin American military officers. This protest is the longest ongoing protest against US empire happening in the United States. It is also the longest ongoing act of civil disobedience. But no CD required to participate! You can be an essential part of it all by helping us interpret. It really is an amazing experience and a great way to be at the heart of a deeply inspiring weekend, where folks gather from across the US and the Americas and share experience and analysis. We're looking for volunteers with professional experience who are comfortable doing simul with equipment in a conference setting. We cover the hotel and have a travel fund. We pay you with boundless gratitude and appreciation from the crowd. The vigil is Nov 22 - 24 in Columbus Georgia - but you could come for just one or two of those days. It's the 23rd that we most need folks. If you can't come but know someone who might, please spread the word! We're especially looking for folks who live in the South and don't have to travel so so far to get there.